DANGA Bay had seen a flurry of investors coming to its place last week, some serious, some just wanted information as to what is available and at what prices. That has become a daily thing at Danga Bay since the end of last year and the visitors came from far and near. Some from within the country, some from Singapore and some as far as China. They are companies and high net worth individuals who are looking for land and properties in Johor, especially at the southern tip of Johore Baru city which fronts Singapore. This is the place that will be transformed into the most modern waterfront city in the region. To develop that, Iskandar Waterfront Holdings Bhd (IWH) has entered into a public private partnership with a state government agency, Kumpulan Prasarana Rakyat Johor (KPRJ). The whole area covers 1,214ha, stretching from west to east of the southern tip and is located next to Iskandar Malaysia, the country's economic corridor in the south. The whole waterfront city project will have a gross development value of RM80bil. The story of Danga Bay dates back to 15 years ago. That was the time Datuk Lim Kang Hoo came to Johor. He liked what he saw and by the stroke of luck he got introduced to KPRJ and that relationship has led him to be party to the development of a waterfront city. Lim was born in Kuala Lumpur. He ventured into the business world 40 years ago by doing small renovations to big ones and has worked in various places until he landed in Johor in 1997/98. “Today he is a much sought-after man in the state, having the right connections and a vast land bank,'' says an observer. But after 15 years, there is really nothing much to shout about in Danga Bay other than some buildings, infrastructure, and a park. However, Lim is quick to point out that he has spent a lot of time rehabilitating the river which was filled with rubbish and sludge. Some sections of Danga Bay has been developed and thus far, IWH has invested RM250mil to reclaim 161.9ha and build the infrastructure in the area. Recently, Prime Minister Datuk Seri Najib Tun Razak announced a RM200mil facilitation fund to kick-start the Iskandar Integrated Waterfront City project in Danga Bay. At the end of January, he created quite a stir when he, via Iskandar Waterfront Holdings Sdn Bhd, announced a proposed purchase of a 33% stake in Tebrau Teguh Bhd from KPRJ. Last week both parties entered into a definitive agreement. The purchase triggers a mandatory general offer that has to be undertaken at 76 sen per Tebrau share. Tebrau stock price has been soaring ever since the sale was announced. The counter closed at 2.5 sen higher to 87.5 sen yesterday. Though Lim seems happy to have partnered KPRJ in the Tebraru deal, some do not think he is paying a fair piece for the 33% stake. They felt the deal should have been worth more though the Tebrau land and the river would also need to be rehabilitated and that would cost about RM250mil, if not more. The funding is likely to come from IWH “given the fact that Tebrau may have insufficient funds to undertake the project as its last audited accounts show that it has a cash balance of RM36mil. Tebrau may need to raise cash. “So this was factored into the deal since IWH had undertaken the rehabilitation of the river at Danga Bay. He also cannot develop a city overnight and it will take time but to be fair, there is some progress,'' said a source. Whatever the critics said, Lim has restructured his companies and turned IWH into a holding company of all the land assets. Because of the Tebrau stake, KPRJ now has increased its take in IWH from 30% to 40% and Lim reduced his stake from 70% to 60%, which he holds via Credence Resources Sdn Bhd. With the partnership, IWH and KPRJ are the master developers that will take charge of the development of Danga Bay, Iskandar Waterfront, Tebrau Coast and CBD development in Johor. IWH will hold 100% equity stake in Danga Bay Sdn Bhd, 20% of Iskandar Coast Sdn Bhd (the remaining stake is held by Iskandar Investment Bhd), 72% of Iskandar Waterfront Sdn Bhd and 33% of Tebrau. In terms of land bank, Danga Bay has 216.5ha, Iskandar Coast 985.4ha, Iskandar Waterfront (240.8ha), and Tebrau (404.7ha). Khazanah Nasional Bhd has 80% stake in Iskandar Investment, KPRJ 20% and the Employees Provident Fund 20%. 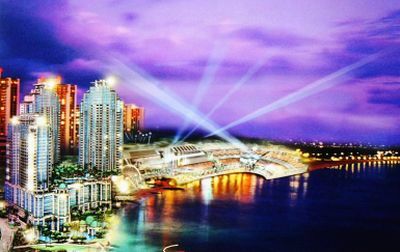 For the waterfront city to become a reality, IWH needs investors. That is why Lim spends five out of seven days in Johor. He personally meets a lot of visitors so that he can get investor and develop parcels of land or just buy plots for the development. IWK has made some progress as it has partnerships with some developers including Dijaya Corp Bhd, Singapore's Azea Residences, Plazzo Hotels & Service, Waz Lian Group, Tune Hotel and Australia's Walker Group. Over the next two weeks a major deal with Brunsfield Group will be inked. Those in the know claim that exploratory talks are on with some Singapore companies including Temasek, CapitalLand and Fraser and Neave Ltd.
“On Thursday, the company had 14 new enquiries and all those who came were taken for a site tour. On an average they get about three to four serious visitors each day and some of whom are high net worth individuals, and the deals will flow through because many want to get the early bird pricing before the valuations go up,'' said a source familiar with IWH. There was one investor who even wanted to buy Danga City Mall but could not agree on the pricing. 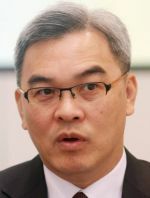 Lim, is also executive chairman of Ekovest Bhd, in which he has a 20.83% stake, and holds a 30% equity stake jointly with the royal family of Johor in Knusford Construction. He also has a 10% stake in PLS Plantation Bhd and last week, KPRJ sold its 23.4% stake in PLS to Iskandar Waterfront Holdings Sdn Bhd and this brings IWH's purchases from KPRJ to a total of RM261mil. KOTA KINABALU: Chief Minister Datuk Musa Aman boarded a train for a ride from the Tanjung Aru railway station to a marquee to launch a redevelopment of the facility existing since for more than a century. Accompanying him on the five minute ride on Saturday was SP Setia group president and chief executive Tan Sri Liew Kee Sin whose company is making its first foray into Sabah with the RM2bil project called Aeropod. That ride, Liew later said, symbolised the journey that Sabah was undertaking from the past to the future with the train station being transformed into a transportation hub and more. The project for SP Setia, that has been described as Malaysia's top property developer, is by any measure a massive undertaking. To be implemented over five phases in a span of about eight to 10 years, Aeropod would ultimately become a place that people would want to go to, said Liew. When fully completed, Aeropod being built on a 24ha site, would feature three hotels, nearly 28,000 sq m of retail space, some 5,000 residential units as well as the new Sabah Railway Department headquarters. He said SP Setia's inaugural Sabah venture began in 2008 when the firm worked closely with the Sabah government for the redevelopment and modernisation of the Tanjung Aru railway station to become a state-of-the art transportation hub. Thus the Aeropod would not only serve as a railway station but would also be geared for the future by being built to accommodate mass rapid transit (MRT) or monorail services. “Our agreement with the Sabah government sees us redeveloping this transport terminal in return for the rights to build a mixed commercial project on the surrounding land,” said Liew. He said Aeropod was modelled after SP Setia's successful SetiaWalk in Puchong and conceptualised along with the group's development philosophy of Live, Learn, Work and Play. “Our award-winning approach of building well-planned developments with great accessibility and extensive amenities within a single location will see to it that Aeropod becomes a hot spot in the state,” Liew added. He said Aeropod would feature boutique retail lots, office blocks, a shopping mall, hotels and serviced apartments. “For investors looking to capitalise on Sabah's rising economic potential to families planning an enjoyable outing, Aeropod will have something to offer everyone,” Liew added. The first phase of the project, according to Liew, would see SP Setia investing some RM235mil covering an area of some 11ha for the construction of among others 28 units of shop lots which have been sold out. That phase would also see the realignment of rail tracks and the construction of the Sabah Railway headquarters and train station apart from building replacement quarters for department staff at Kinarut. “Our pledge that despite the ongoing work at the railway station, there will be no disruption of train services,” Liew added. He said other components of the first phase include the Galleria - a public area featuring among others a huge aquarium showcasing Sabah's diverse marine life as well as a railway museum. He said the first phase would also see the construction of two ramps or flyover for easier vehicle traffic access between Aeropod and the nearby Jalan Kepayan. Liew said SP Setia had also committed to preserving the Kepayan Ridge hills just behind the project site and instead landscape it to become a park.